Free sewing tutorial and pattern toddler dress with peter pan collar – from small dreamfactory. Isn’t this adorable? I found it while looking for something a bit easier than this (I don’t want to mess with zippers and linings) but I had to share because it was so cute! how to make an a-line dress – a sewing tutorial from Cool People Sew. This one has me rethinking my stance on linings. It looks pretty simple, and hey! reversible! Bulky Indigo-dyed Mittens for July – a knitting pattern from Cozy Things. Here’s a quick and thrifty knit, completed in an afternoon from reclaimed and redyed yarn. 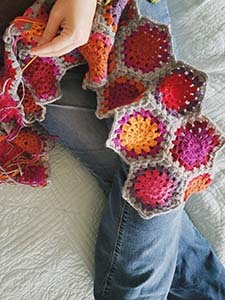 The pattern is pretty simple, and if you can bring yourself to think wintery thoughts on a summer day, have at it! How to improvise a top-down sweater – an awesome knitting series from Fringe Association. I just spent all morning reading through these posts. I would call them essential reading for anyone who wants to knit a sweater designed to fit their own unique curves. Upcycled Jeans Quilt – a repurposing project from Andrea’s Notebook. This is really cool! I was thinking, if you don’t have jeans in a lot of different colors, and you like your quilt dark, you could throw some of the jeans into dye baths and end up with some deep jewel tones. Have a lovely Summer Friday! Previous post: Fancypants: What do you want to know? Yay! I’m back after a short hiatus for the move across the country. And here you are, just where I knew you’d be. I love looking through your link posts. Welcome back! I’m glad that me being predictable is a good thing 😉 I hope your move went smoothly!